The iRocker Blackfin Model XL has excellent stability and capacity. We love how spacious and stable this inflatable stand up paddle board is as well as very comfortable and fun to ride on. Stability is its most outstanding feature but it is certainly not the only good thing about it. This iSUP is the whole package. It has everything else you want in a paddleboard: reliability, quality, durability, versatility, and good looks. On top of that, it comes with premium accessories. All this at a surprisingly affordable price. Its quality and features are above any other board at its price point. 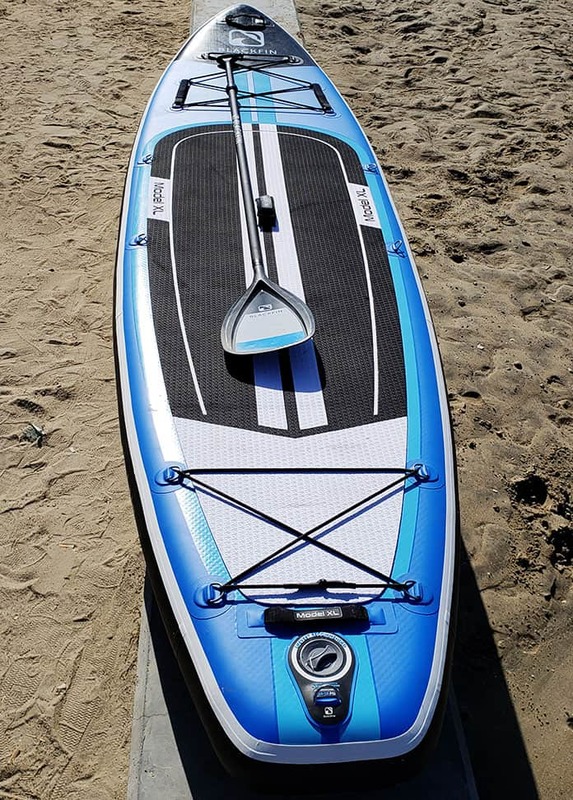 The iRocker Blackfin Model XL is definitely one of the best paddle boards on the market for 2018.
iRocker is a reputable provider of premium quality and super durable yet accessibly priced inflatable paddle boards. Their 2018 boards have rocked the market. Currently, this collection is composed of the Blackfin Model XL, Blackfin Model X, iRocker Sport, iRocker Cruiser, and iRocker All Around paddle boards. 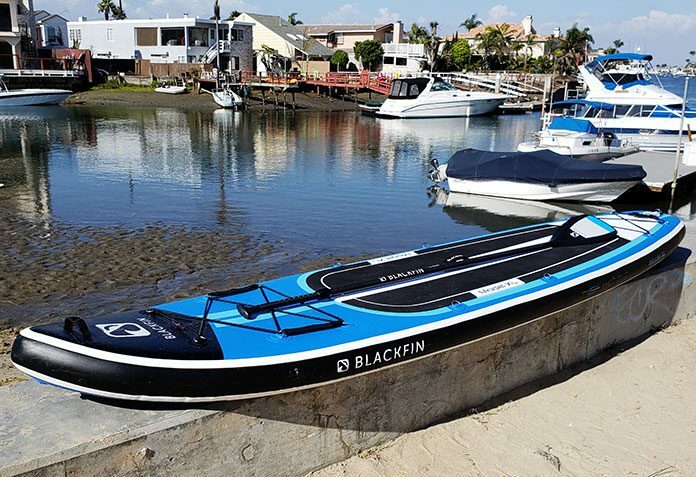 We are especially impressed by the Blackfin Model XL 11’6″ iSUP, the largest board in this new lineup. It offers excellent stability, features top-notch materials and craftsmanship, is packed with premium features and is affordably priced. Its quality, features, and accessories equal or surpass those of premium boards costing twice as much. 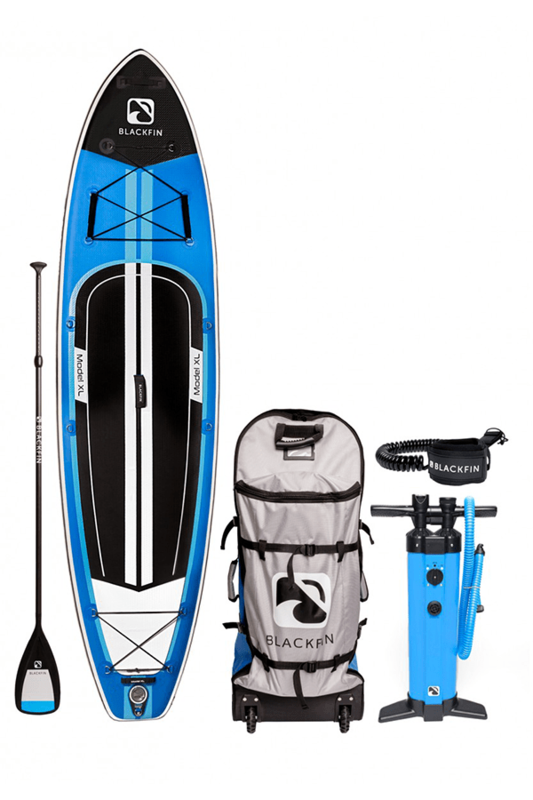 The Blackfin Model XL paddle board is extremely versatile. Paddlers of all skill levels from beginners looking for stability to seasoned users looking for a high capacity board with the best combination of stability and performance have a great time riding it. Its 485-pound capacity makes it excellent for larger riders, family rides, or paddling with a lot of gear onboard. It is perfect for SUP fishing, flatwater paddling, SUP fitness, cruising, touring, yoga, and even whitewater river riding. The iRocker Blackfin Model XL features a military-grade core made of quad layer drop-stitch PVC material. Being a Blackfin model, it also has carbon rails on the sides for added stiffness. This construction makes this board as rigid as a hard board and extremely tough and durable. It is immune to drops, dents, and dings. Its high-quality EVA foam traction pad is grippy and feels firm yet comfortable. The stamped logo is a cool touch. In the middle of the traction pad is the board’s carrying handle, which is covered by a soft neoprene cover for comfort when lifting it. The board features a triple fin system with two fixed side fins and a large, detachable center fin. The fin box is a U.S. fin box, so you can swap out the fins. There is no shortage of storage space onboard. This board has a whopping 16 D-rings for attaching accessories. Well placed and soft safety grab handles provide a secure and comfortable place for novices and kids to hold onto during rides. In the looks department, you’ll definitely attract envious glances, inquiries, and compliments when riding the iRocker Blackfin Model XL. There’s only one color scheme currently – blue, black spots, white stripes, shimmering finish on the nose – but it’s neutral and attractive. Inflating: As advertised by iRcoker this board can inflate up to 15 PSI. 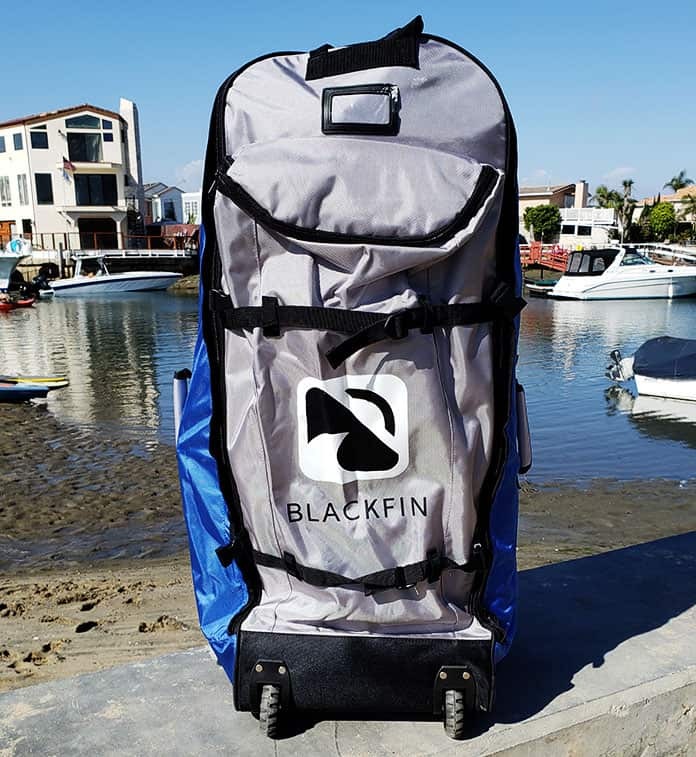 In the BLACKFIN Model XL package, you will find everything you need to get started paddling including a paddle, pump, SUP bag, repair kit, coil leash, and detachable fin. These accessories are top-notch quality and similar to what premium boards costing twice as much offer. A super-efficient triple action dual chamber high-pressure hand pump. This is a really good pump comparable to the one that comes with the Red Paddle’s Titan. A carbon shaft paddle that matches the nose of the board in look. It is lightweight at 32 oz, floats, has a comfortable rubber grip, is adjustable in height, and breaks down to 3 pieces for convenient storage. A repair kit in a screw top canister. A 10′ heavy-duty and comfortable coil ankle leash for SUP safety. A wheeled SUP travel backpack. Optional: Also available for purchase separately is a Kayak conversion kit, a cooler deck bag, and a SUP shoulder carry strap. Set up: Setup is simple and straightforward. With the included triple-settings pump, inflation takes 5 to 10 minutes. Because of its size and reinforced build, it does take some effort to pump it manually. Getting an automatic pump is a great idea for an effortless experience. Deflation is super fast and the board is a 36″ wide by 15″ diameter package when rolled up. The Ride: Fully inflated, the board is stable and feels as firm as a hardboard. This board is not the fastest but its speed is decent. It glides smoothly on the water and is nimble enough to turn easily – the rounded point nose easily cuts through the water and the slim tail reduces drag. It does take more powerful strokes at the start or a little more time to build up speed. It stays rock solid on flat waters or light current but with its slow maneuverability, surfing strong waves with it would be a frustrating experience. You won’t be winning any speed contests with it but is a very fun ride! The extra wide 34” width provides excellent stability while the overall design ensures this isn’t at the expense of performance. The board is easy to use and tracks very well in the water. Reinforced construction using the strongest board materials makes this board extremely rigid and sturdy and incredibly durable. The board and its parts are top notch quality and it comes with premium level accessories making it fantastic value for money. The high weight capacity accommodates multiple riders comfortably and safely, making it perfect for family adventures, camping trips, or taking the dog along. iRocker’s customer support is superb. They back their boards with a 30-day money back guarantee and 2-year warranty. This board is versatile enough to be an all-rounder. It suits all water conditions, skill levels, and SUP applications. It even converts into a kayak. The board has an attractive finish and is a pleasure to own and ride on the water. For an iSUP, the iRocker Blackfin Model XL is a bit on the heavy side at 32 pounds. This is due to its size and heavily-reinforced build. If you have to hike or trek a good distance on foot, this weight will be a drag. The main fin has a metal twist on screw with a nut you have to put in to secure the fin to the board. This can be lost if your not careful. Price: 100% – This is a premium-quality inflatable SUP with premium quality, features, and accessories and an affordable price tag. It is comparable to the more expensive Red Paddle SUP. This makes it a fantastic value. Material: 100% – Built using the strongest materials and reinforced with carbon rails, this board is the ultimate in rigidity, reliability, and durability. Design: 100% – A well-thought-out design. The attention to detail is incredible. The extra width gives it excellent stability for comfortable and fun rides. The nose and tail design give it good speed and turning capability. The finish is stunning and the board looks amazing on the water. Overall: 100% – This is a highly-rated inflatable stand up paddleboard. 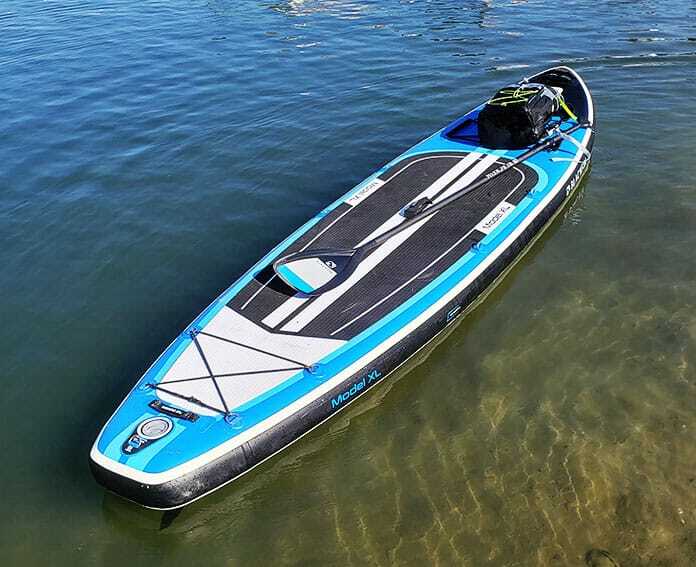 Excellent stability, extreme versatility, high-quality construction, large capacity, attractive looks, great performance on the water, and accessible pricing make it one of the best inflatable stand up boards on the market. The iRocker Blackfin Model XL offers stable and fun rides. With the quality, durability, premium features and accessories and the affordable price, we feel confident saying this board offers the best value for money. And it looks nice on the water. If you want a board wide and stable enough to accommodate your kids, dog or extra luggage, it is definitely the board for you. The stability it offers means beginners can have a lot of fun without worrying about falling. It is ideal for flatwater activities like touring, cruising, fishing, yoga. It also suits whitewater paddling as it can handle choppy waters. You can also use it as a kayak. However, this inflatable paddle board is not the fastest or lightest SUP. If you want a fast and sporty board, the iRocker Sport is more your style. If you’re looking for better speed with good stability, consider the All Around model. If you’re interested in the iRocker Blackfin Model XL, head over to iRocker’s website to check out the rest of the customer reviews and get free shipping when you’re ready to buy. Did you try the iRocker Blackfin Model XL yet? Let us know what you think about this amazing board! We love hearing your experiences in the comment section below. The iRocker Blackfin Model XL has excellent stability and capacity. We love how spacious and stable this inflatable stand up paddle board is as well as very comfortable and fun to ride on.